This panel was in the collection of the Dukes of Hamilton in the UK during most of the 19th century. In 1906 it was owned by the Duchess of Montrose at Castle Brodick on the Isle of Arran (Scotland), from where it was acquired for the Thyssen-Bornemisza in 1938, increasing the collection’s holdings of Early Flemish painting. 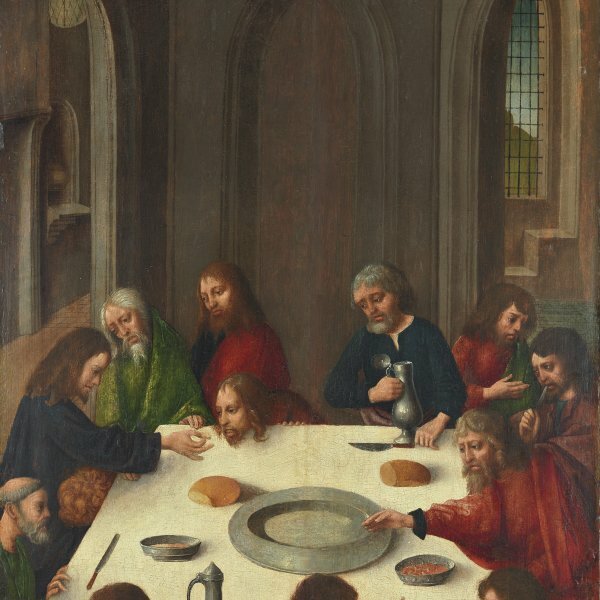 The panel has been dated to Memling’s mature period around the mid-1480s. This dating, proposed by Eisler in 1989, was put back to 1490 in the catalogue of the exhibition devoted to the artist in Bruges in 1994. The latter date had already been suggested by Friedländer in 1937, who considered the portrait to be one of Memling’s finest. The nature of the original overall ensemble to which this panel belonged has also been the subject of debate, and it may have formed part of a diptych or triptych. The position of the man, shown in prayer, and the presence of a loggia opening onto a landscape with an oriental rug on the ledge make it seem likely that to the right of this figure there would have been a second panel with an image of the Virgin and Child, and that the landscape would have continued in that second space. If the work had formed part of a triptych there would have been a figure of a female donor on the right wing. The exterior images of this hypothetical triptych, in addition to the present Flowers in a Jug, would have consisted of another still life or the coat-of-arms of the depicted couple. If the panel had formed part of a diptych this image would have been combined with a depiction of the Virgin and Child. Both diptychs and triptychs of this kind appear in Memling’s oeuvre. However, in surviving diptychs by the artist such as the Maarten van Nieuwenhove Diptych in the Memlingmuseum in Bruges, or the one in the Chicago Art Institute, the male image is on the right and the Virgin on the left. The orientation of the present sitter thus suggests that this panel did not form part of a diptych. In contrast, Memling’s triptychs locate the man on the left and the woman on the right, as we see in the Portraits of Willem Moreel and his Wife in the Musées Royaux des Beaux-Arts, Brussels, and those of Tommaso Portinari and his Wife in The Metropolitan Museum of Art, New York. On the basis of their compositions and backgrounds these examples, which have survived without their central image, have been considered to be parts of triptychs whose lost central panel would have been an image of the Virgin and Child. Although neither a female image forming a hypothetical right wing nor a central Virgin have been identified, the present panel must have belonged to an ensemble of that type. It has been thought that the donor and patron might have been a member of the Italian community living in Bruges. This idea is based on the type of clothes and hairstyle, although other authors have suggested a Spanish client. 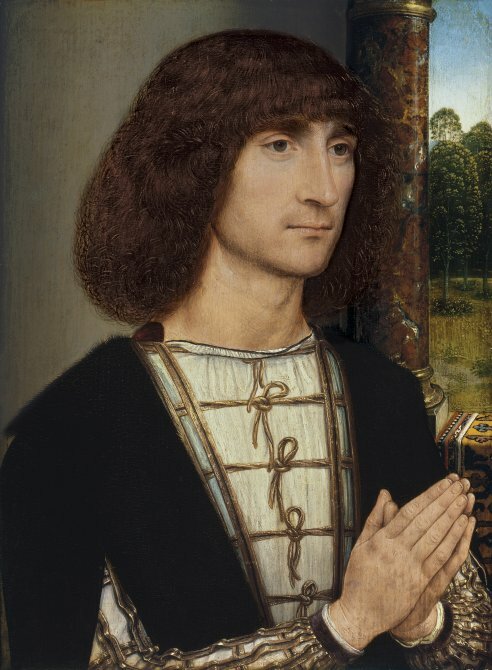 Memling’s portraits are among his most interesting and appealing works, but their chronology is difficult to establish. We find depictions of members of the Bruges middle classes, as well as sitters from other European countries who were in Bruges for reasons of commercial activities. This is the case with the Italian and Spanish clients for whom the artist worked. Memling used plain backgrounds for his portraits, following the style of his predecessors. He also used open landscape backgrounds and although not the first artist to do so, contributed in a crucial manner to disseminating this model in Flemish art. 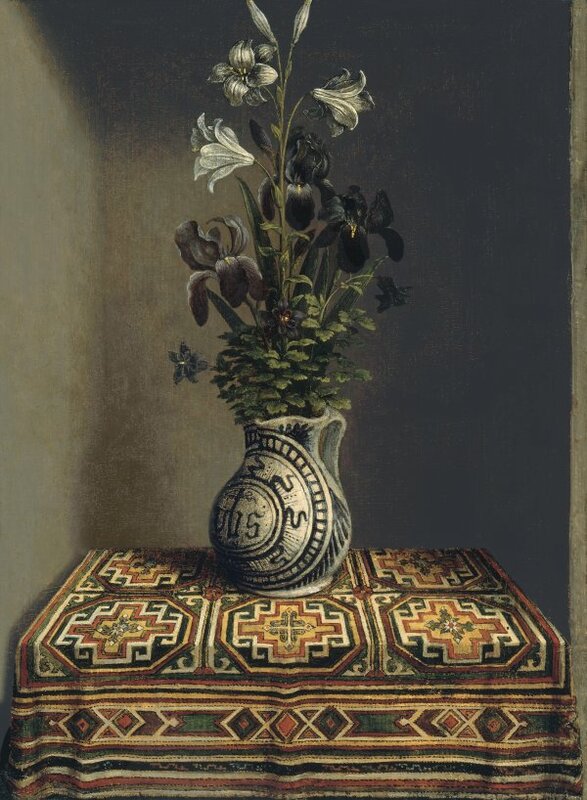 The jug of flowers on the reverse is one of the first independent still lifes known in art. However, this early flower composition has a religious significance as it contains symbols referring to Christ and to the Virgin. The maiolica jug has Christ’s monogram on the front while the flowers refer to Mary: the lilies refer to her purity, the irises to her role as Queen of Heaven and to her role as mater dolorosa during the Passion, and the small aquilegias are associated with the Holy Spirit. The rug on which the jug is standing is of an eastern type, as is the one behind the sitter on the front of the panel. Rugs of this type came to be known within the textile world as “Memling” rugs.